Combines an RGB input with a Matte input to make a single RGBA output. This plug-in is only needed in special circumstances, and for conforming from v1. In most cases it is not needed because in v2 you can now apply any effect to a title or key directly. It is useful if you have imported a matte and fill as separate clips, and you want to combine them to be processed by other Sapphire plug-ins. You can also invert the matte, and use various compositing options. It assumes the Matte input has CCIR601 levels, so it makes video black completely opaque and video white transparent. For more information, check the documentation for Alpha Processing and Processing Titles and Keys . Matte: Selectable. Makes the alpha channel from this input clip. Foreground: Selectable. Uses the RGB from this input clip. Background: Optional. This input is ignored by default. However you can enable it to composite the Foreground input over the Background using the Matte. Invert Matte: Check-box, Default: on. If enabled, the black and white of the Matte clip are inverted before combining with the RGB clip. Comp Premult: Check-box, Default: off. If enabled and the Background input is present and selected, the foreground is composited over the background using a premultiplied (additive) composite. If this parameter is disabled then the composite is non-premultiplied (straight). If no Background input is present, this parameter's value is ignored. Output Premult: Check-box, Default: on. 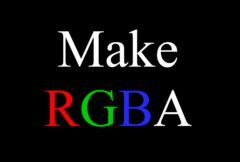 If enabled, the RGB clip is multiplied by the Matte clip before combining and/or compositing. Alpha Black Level: Integer, Default: 16, Range: 0 to 255. The pixel value in the alpha source that will be interpreted as full black. For CCIR601 levels (Avid standard for 8 bit images), 16 is black and values below 16 are superblacks. If your alpha clip has superblacks and superwhites, use 0 and 255 for alpha black and white levels. 16 bit images generally are imported with 0 and 255 as black and white, so use 0 and 255 in that case as well. If you notice some of your foreground or background bleeding through where the alpha should be fully opaque or transparent, adjust these params to clean that up. Alpha White Level: Integer, Default: 235, Range: 0 to 255. The pixel value in the alpha source that will be interpreted as full white. For CCIR601 levels (Avid standard for 8 bit images), 235 is white and values above 235 are superwhites. If your alpha clip has superblacks and superwhites, use 0 and 255 for alpha black and white levels. 16 bit images generally are imported with 0 and 255 as black and white, so use 0 and 255 in that case as well. If you notice some of your foreground or background bleeding through where the alpha should be fully opaque or transparent, adjust these params to clean that up. Opacity: Default: 1, Range: 0 or greater. Scales the alpha channel by this amount to adjust the transparency of the Foreground clip. Scales the brightness of the Foreground by this amount. Adds this gray value to the darker regions of the Foreground. This can be negative to increase contrast. See general info for: Resolution , Clamp Output To Legal , Bypass Effect , and Reset .